Ooh check out that posh sounding French name, I'm probably pronouncing it like an idiot but doesn't it sound sophisticated? 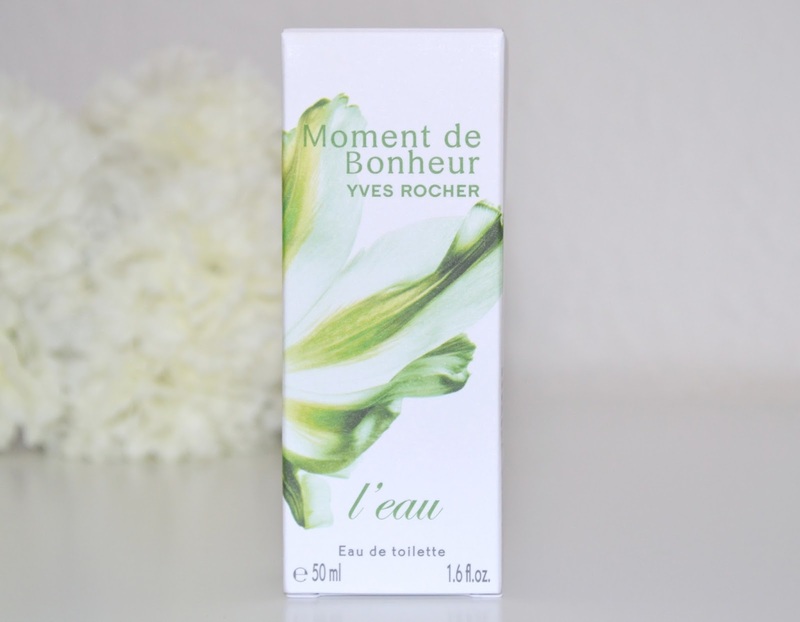 Moment de Bonheur L'eau is a brand new release from Yves Rocher, and is a fruity twist on their original version of the perfume. 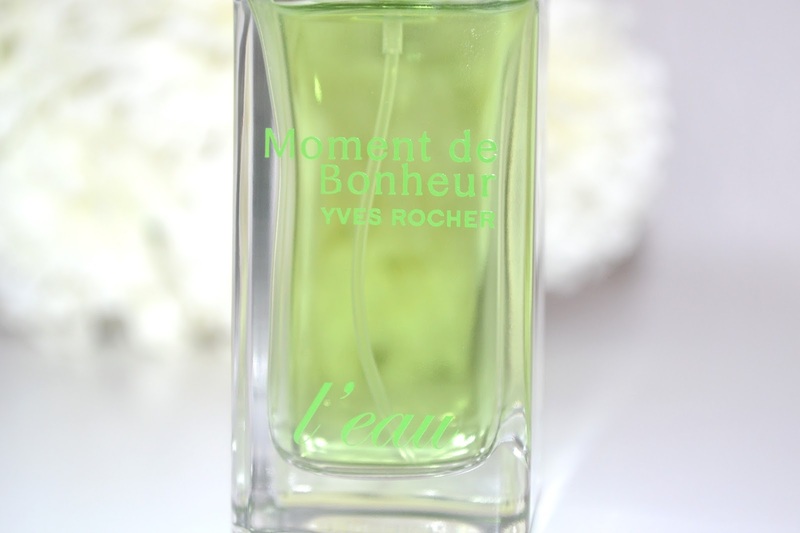 I first tried Yves Rocher perfume a few weeks ago when I was won over by their Evidence scent; while this smells completely different it still follows suit of being clean and uncomplicated (I'm guessing this is something all Yves Rocher fragrances have in common). The best way I can sum up this particular scent is 'musky, fruity and fresh', while most people would probably consider this as a daytime scent with it being so light- I actually think it will be a nice one for summer evenings. On first spray you get the fresh, fruity sweetness of the apple, and over time it settles to a sweet musk with a very slight floral undertone. It's definitely not a floral perfume but you do get a bit of the rose scent over time (centifolia rose is apparently the most beautiful rose used in perfumery!) It's more sophisticated than your average fruity perfume, and is overall a pleasant scent that's impossible to dislike. For an EDT Moment de Bonheur L'eau has excellent staying power, I think it's because it's quite a musky scent which is one note that tends to linger on the skin for ages. If you're looking for a sweet, fresh and fruity scent but don't want to go down the route of typical sugary sweet perfume (which I'm personally a huge fan of but I'm sure there are people out there who aren't!) this is definitely one to try. I like the packaging of this too, the glass is nice and heavy and it looks pretty out on display. Which perfumes are you loving for spring? I really want to try this. I love the scent of apple and the bottle is so cute! That is such a pretty green colour..I'm such a sucker for packaging! 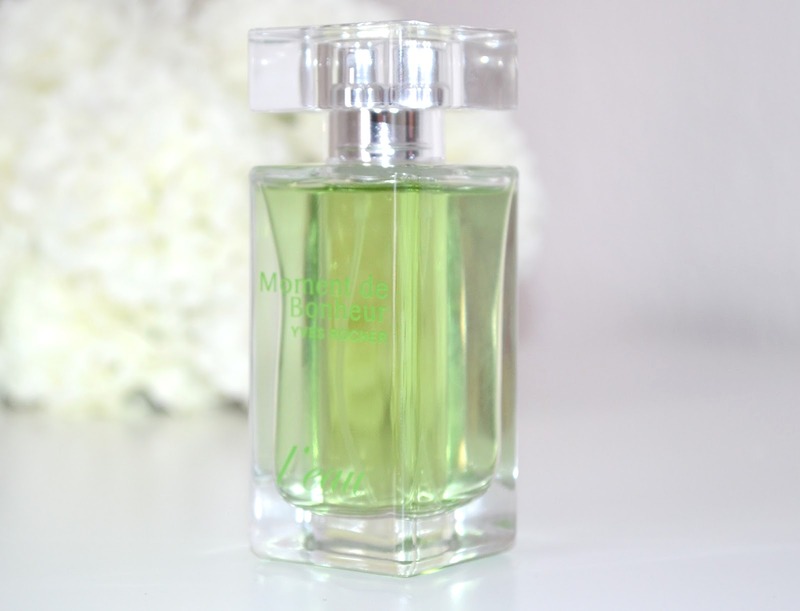 I've literally just posted a blog on this very perfume - it's so lovely! I don't think I've tried a perfume with these notes before so I'll have to keep my eye out for this. It sounds so lovely!